Historically, the landscape of Suisun Marsh was dominated by tidal wetlands, with vast expanses of marsh plain that would flood during high tides (Moyle et al. 2014). In 1897, construction of a railroad through the western marsh facilitated rapid development of managed wetlands for waterfowl hunting (Arnold 1996). Today, approximately 340 km (210 miles) of constructed levees separate about 210 km2 (52,000 acres) of managed marsh from tidal waterways (Moyle et al. 2014). The Suisun Marsh Habitat Management, Preservation, and Restoration Plan mandates (1) conversion of 20-30 km2 (5,000- 7,000 acres) from managed wetlands to tidal wetlands and (2) the enhancement of 160-200 km2 (40,000- 50,000 acres) of managed wetlands (United States Department of the Interior Bureau of Reclamation 2013). Understanding how managed wetlands influence subtidal waterways is important for water management and the development of restoration designs that will benefit aquatic species. 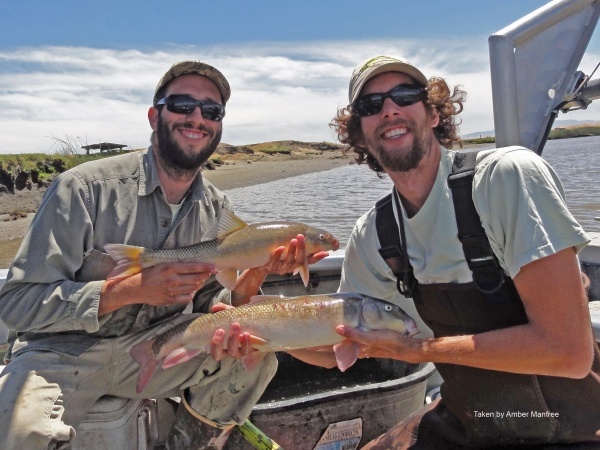 To address this knowledge gap, the UC Davis Blacklock Fish Study was initiated in October 2013 to collect and interpret information on the distribution and abundance of fishes in a restoring tidal marsh, a managed wetland, and adjacent tidal waterways. We used catch per unit effort (CPUE) of fishes collected during monthly trawl and beach-seine sampling conducted by the Blacklock Fish Study to evaluate differences in the distribution and abundance of fishes among a managed wetland, a restoring tidal wetland, and adjacent subtidal sloughs and embayments.